Browse » Home » 1910S TEN CENTAVOS , manila mint , philippine banknote , philippine banknotes , philippine coins , philippine money , rare coins , united states and philippine coinage » The 1910 S Ten Centavos: Truth or Dare! It had been more than two decades since the 1910 San Francisco Mint Ten Centavos was published that if somebody would have found it, the collector would have paid a great sum to have the fabled coin. The 1910 S is one of the famous numismatic pieces that had a very colorful background. Almost a century and there is still no confirmed and graded specimen had ever surfaced except for those 1918 S that were with altered dates to look like the 1910 S. Luckily, I was able to meet the person who claimed that he possesses the most intriguing coin in Philippine numismatic history. He don’t want to tell his name for a valid reason since nowadays that fakery and counterfeiting are so rampant that he wanted to protect his name and integrity, and the same with that of his prize possession. I otherwise is in no position to claim that this is the genuine article except to show to you the picture of the coin since it had never undergone professional grading and I myself was not able to hold the piece that long for further scrutiny. Anyway, the story seems to be interesting enough for me to take time and have the owner interviewed. According to historical record, only two pieces of the coin were produced and one of the two specimens was acquired by the National Museum and had it displayed until the World War II erupted. The National Museum as we know was destroyed by Japanese air raids during the war. Together with that, a great lost of Philippine historical records and artifacts went missing as massive looting and fires destroyed much of the collections among them to name a few were the skeletal remains of Andres Bonifaco and the 1910 S Ten Centavos. There were no reports of its existence nor any could claim that the 1910 S Ten Centavos did ever exist except with this account. Not until a famous newspaper advertisement decades ago that the numismatic world became aware of its existence. However, after the story surfaced other craftsmen and forgers started producing faked or altered date 1918 S Ten Centavos to make money with the treasure hunt. Thus, a number of collectors and dealers began to doubt if there really is a 1910 S Ten Centavos or it is just one of the fairy tale of the numismatic world. I asked my subject how did he acquire the piece. He explained to me that he was not aware that he has the coin in his collection since it came from a bulk of coins he bought from a sidewalk vendor during his visit in the Northern part of the Philippines. He was not otherwise aware that that particular coin exists since he has no reference, catalogues, nor much knowledge of coin mintage since he is not that serious into coin collecting. When he joined the Philippine Numismatic and Antiquarian Society (PNAS), a local numismatic club then he learned that the coin that he now owns is that rare. Since he is also afraid to show the coin in public because of the counterfeit phobia he decided to hide the coin and just enjoyed it in privacy. Otherwise, he wants it be professionally graded first before he could brag that he owns the fabled coin in Philippine Numismatic history. The owner wishes anonymity but he granted us to have the coin’s picture. You’ll be the judge of course, truth or dare! 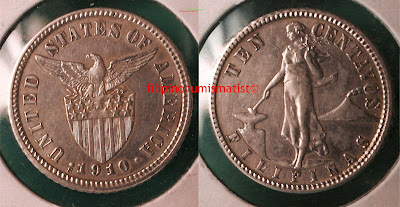 i have one of that ten centavos coin(1908)..
maybe you can help me sell it..